Difference between revisions of "Nine Inch Nails"
'''Nine Inch Nails''' is the studio name for [[Trent Reznor]], as well as the name of the band hired by him to perform songs while on tour. It is an industrial rock band, and the most recognized one since the genre was introduced. '''Nine Inch Nails''' is the name of a music project by Trent Reznor and [[Atticus Ross]], as well as the name of the band hired by them to perform songs while on tour. It is an industrial rock band, and the most recognized one since the genre was introduced. Before Ross's inclusion in 2016, Nine Inch Nails was solely under the creative direction of Trent Reznor. Nine Inch Nails (commonly abbreviated as NIN) was formed in Cleveland, Ohio, circa 1988, and have so far released seven full-length studio albums, seventeen EPs, a number of remix albums, and some live compilations. Reznor is the only official member and has always been solely responsible for the musical direction of the band. His lyrics are largely concerned with the exploration of the self, but with albums such as ''[[Year Zero]]'' and ''[[The Slip]]'', the lyrical focus has shifted somewhat to extrospection. Nine Inch Nails (commonly abbreviated as NIN) was formed in Cleveland, Ohio, circa 1988, and has so far released nine full-length studio albums, four EPs, seventeen singles, several [[Remixes|remix]] collections, and some live material. Reznor is the only official member and has always been solely responsible for the musical direction of the band. His lyrics are largely concerned with the exploration of the self, but with albums such as ''[[Year Zero]]'' and ''[[The Slip]]'', the lyrical focus shifted somewhat to extrospection. Earlier NIN material was created almost entirely by Reznor, but starting with ''[[The Fragile]]'', he began to allow for a more collaborative writing process involving other players. After recording a new album, the assembly of a new band usually follows, along with extensive touring; the live component of Nine Inch Nails is largely considered a separate entity from NIN in the recording studio. NIN's live shows often involve visually spectacular elements such as screens and lighting rigs, which were used on the [[Self Destruct Touring Cycle|Self Destruct]], [[Fragility]], With Teeth Arena Tours ([[With Teeth Fall Arena Tour|Fall]] & [[With Teeth Spring Arena Tour|Spring]]), [[Performance 2007]] and [[Lights In The Sky Tour|Lights In The Sky]] tours, and would sometimes culminate with the destruction of musical instruments. 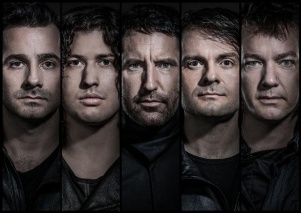 After recording a new album, the assembly of a new band usually follows, along with extensive touring; the live component of Nine Inch Nails is largely considered a separate entity from NIN in the recording studio. NIN's live shows often involve visually spectacular elements such as screens and lighting rigs, which have been used on the [[Self Destruct Touring Cycle|Self Destruct]], [[Fragility]], With Teeth Arena Tours ([[With Teeth Fall Arena Tour|Fall]] & [[With Teeth Spring Arena Tour|Spring]]), [[Performance 2007]], [[Lights In The Sky Tour|Lights In The Sky]] and [[NIN 2013-2014]] tours, and would sometimes culminate with the destruction of musical instruments. *''[[Closure]]'' (1997) Music video & Live documentary double VHS set. *''[[Beside You In Time (halo)|Beside You In Time]]'' (2007) DVD, HD-DVD, Blu Ray. For more on the history of Nine Inch Nails, see Trent Reznor. For the Wikipedia entry on Nine Inch Nails, click here. Nine Inch Nails is the name of a music project by Trent Reznor and Atticus Ross, as well as the name of the band hired by them to perform songs while on tour. It is an industrial rock band, and the most recognized one since the genre was introduced. Before Ross's inclusion in 2016, Nine Inch Nails was solely under the creative direction of Trent Reznor. Nine Inch Nails (commonly abbreviated as NIN) was formed in Cleveland, Ohio, circa 1988, and has so far released nine full-length studio albums, four EPs, seventeen singles, several remix collections, and some live material. Reznor is the only official member and has always been solely responsible for the musical direction of the band. His lyrics are largely concerned with the exploration of the self, but with albums such as Year Zero and The Slip, the lyrical focus shifted somewhat to extrospection. Earlier NIN material was created almost entirely by Reznor, but starting with The Fragile, he began to allow for a more collaborative writing process involving other players. After recording a new album, the assembly of a new band usually follows, along with extensive touring; the live component of Nine Inch Nails is largely considered a separate entity from NIN in the recording studio. NIN's live shows often involve visually spectacular elements such as screens and lighting rigs, which have been used on the Self Destruct, Fragility, With Teeth Arena Tours (Fall & Spring), Performance 2007, Lights In The Sky and NIN 2013-2014 tours, and would sometimes culminate with the destruction of musical instruments.